Welcome to your Prom Headquarters! Where your night of fun, fashion, and dancing is our number one priority! We understand that prom can be stressful: from what to wear and what to plan for…it can all get a little overwhelming. We will be there for you every step of the way. In this blog we are going to go over various prom styling trends, as well as how to match your date’s attire. Are you ready for this…it’s about to get lit up in here! Not really, but keep scrolling down. We are seeing many common trends for dresses this year: all shades of pink, blue, yellow, and burgundy. As well as patterned and two-piece gowns in metallic, sequins, and floral materials. You might be thinking: "how the heck to I match a sparkly dress?!" Now there is the traditional answer to this question: black tuxedo with a vest and bow tie to match your date’s look perfectly. We can totally accommodate this, easy peasy. Yet, if you are not a simple black tuxedo person, or if you want to feel more unique in your attire we got your back with that as well! The key is to find pieces that compliment the look your date is wearing and not necessarily match perfectly. Are any of these looks matching the champagne dress perfectly? No, but they compliment (get ready to hear this word many more times folks!). Great dipping skills there you guys! Even with a blue prom dress, a colored prom tuxedo in purple and a suit in green still worked with it since we kept the accessories neutral. And the light blue prom suit looked cool and monochromatic with her prom gown was in the same color family but much lighter. -A navy blue tuxedo with a rolled pant and velvet bow tie. Both looks bring out the bold color of her dress, while still showing they have style of their own. 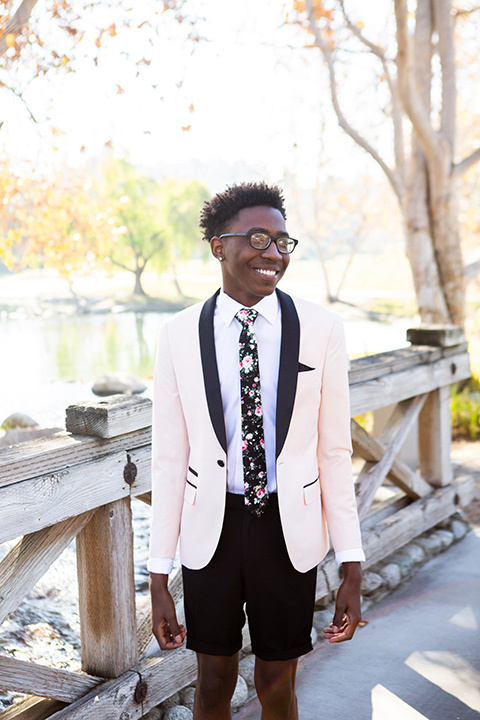 When trying to find the best prom suit, it is all about personal style. Be bold with your tuxedo colors for prom! Why not? With our wide array of colorful and stylish suits and tuxedos, we know we can create the best look for you. Find your nearest Friar Tux location and come in to see all of the 2019 prom suits and tuxedos in person and have a complimentary Stylist appointment to select your look and get fitted! *Giveaway abbreviated rules (visit ftprom.com for complete rules): NO PURCHASE NECESSARY. MANY WILL ENTER, FEW WILL WIN. So. Cal./Las Vegas only. Must be 15-19. Promo ends 5/26/19. See Official Rules at ftprom.com/cash. This promotion is in no way sponsored, endorsed or administered by, or associated with Instagram or Facebook.